In addition to the articles below, Pauline also writes The Strad magazine’s Masterclass and Technique pages every month. Bow hair creaks on strings in the darkness; low cello tones rumble like warehouse pipes; glissandos, percussive taps on wood and pizzicatos build together to a climax as lights flash with increasing strength, revealing first one dancer, then two, then three, moving in wild spasms on the stage. More join from the shadows, until there are seven – and then, sudden silence. Light pours in to reveal a string quartet, each player in a different corner of the stage, and the dancers’ feet thud on to their atonal harmonies. Behind them, pearly patterns of light flutter on a projector-screen wall. For the next hour, dancers and musicians explore darkness, light and colour, space and movement, in juxtaposed episodes of chaos and order. ‘Stand back,’ warns Laurits Larsen, founder and CEO of Larsen Strings. We’re at his factory in Sønderborg, Denmark, and he’s about to show me how he made his first cello string almost 30 years ago, in his garage, using a winding machine originally used to make piano strings. The machine itself is around a hundred years old, from a time when, he quips, health and safety standards were low. He attaches a steel wire between the two wheels, winds the machine into action and carefully coats the core in a dampening glue, then pulls a strip of thin metal ribbon along the spinning centre. When he has finished, he examines the winding under a pocket microscope to check that it is even, spins it through a piece of sandpaper to smooth the surface, and wraps the ends with brightly coloured cotton. He proudly dangles the new, hand-made string in front of me. It’s 11am on a Sunday in June and I’m at the Dresden Music Festival, at the Kulturpalast, waiting for a concert to begin. Cellist Jan Vogler (the festival’s artistic director), violinist Mira Wang (his wife) and pianist Vanessa Perez are due to perform music with an unusual twist: it will be interwoven with readings by Hollywood actor Bill Murray. They are late. After some time the audience claps hopefully. Nothing. Are we to be subjected to the rock-star behaviour of the rich and famous, I wonder – will we be left sitting in suspense for house? Will they turn up at all? Three-hundred years ago in July, Handel’s Water Music was premiered on a barge floating down the Thames, in honour of King George I of England. This week, the suites received an even wetter centenary celebration – at least for the audience, who trod water as they were serenaded by Budapest Festival Academy students and teachers from the side of a large, thermal pool at the Hungarian capital’s Széchenyi Baths. Onlookers – including the festival’s artistic directors, violinists Barnabás Kelemen and Katalin Kokas of the Kelemen Quartet, and pedagogues such as violinist Mimi Zweig and violist Atar Arad – drifted, swam, floated or sat on the pool steps, dwarfed by Neo-Baroque buildings, curling lampposts, the night sky and a glowing moon. Dresden is a city of old and new, populated by ghosts: remains of buildings bombed in World War Two, reconstructions of others; modern eyesores that fill war-flattened land, reaching skywards in the form of apartment blocks, hotels and cranes; and still beautiful Baroque buildings that stand strong and defiant. There could not have been a more fitting location for this one-off performance by the MDR symphony orchestra and choir, with composer Sven Helbig on electronics. Helbig’s scoring juxtaposed traditional and modern compositional techniques before the cinematic backdrop of a silent black-and-white movie about German priest, monk, composer and theologist Martin Luther (1483–1546), whose statue guards Dresden’s Frauenkirche still today. Performing as a soloist with an orchestra can be a nerve-wracking experience, particularly for competition finalists who have very little rehearsal time. I talk to jury members, conductors and soloists about how to prepare. Interviewees are: cellists Maximilian Hornung and Arto Noras; violinists Vera Tsu Weiling and Francesca Dego; conductors Marin Alsop and Hannu Lintu. A train winds northwards from central Oslo towards the city’s outskirts, up into the hills. Stop by stop, more and more college-aged string players board, wrapped in coats and scarves to guard against the cold, despite it being only August. When we reach Voksenkollen station, near the end of Oslo’s metro line, all pile out of the carriages and on to the platform, before beginning the uphill trek to Voksenåsen Hotel – the location of Voksenåsen’s Summer Academy for strings, now in its 20th year. All around me, bamboo-like slats rise up to a ceiling made from giant, woven strands of what looks like flax; horizontal strips of wood demarcate different floors. I could be sitting in a giant dim sum basket – but in fact it is Shanghai’s Symphony Chamber Hall, where I am awaiting the first contestant in the final section of the Shanghai Isaac Stern International Violin Competition (SISIVC) semi-final. And indeed, things are about to heat up, as 18 contestants prepare to perform Mozart’s Third Violin Concerto, all with their own cadenzas. Adventures in sound: should teaching children improvisation and alternative styles of music be a requirement of string lessons in the 21st century? Three violin teachers sit before an audience in an old hall in Ljubljana, Slovenia, dwarfed beneath a towering ceiling. One rocks impatiently from foot to foot; another calmly observes her surroundings; the third squirms, her eyes nervously flicking between the audience and her violin. Before them stands Berlin-based primary school string teacher Agnes Stein von Kamienski, waving a wizard-shaped hand puppet in the air. ‘Now, play D major in this character,’ she says, as the puppet flicks and dances madly. Each of the seated teachers – audience volunteers at the 2016 European Strings Teachers Association conference – performs a simple improvisation on a one-octave scale, rife with sound effects and hopping rhythms. Kamienski whips out another puppet – a creeping wolf – and they try again. The improvisations mimic the teachers’ body language: one is plucky and wild; the next is more stately and controlled; the last in gentle, verging on timid. But in all cases the scale becomes a creation, not just a replica. Even blizzards and thunderstorms – hard though they tried – could not keep audiences at bay at the European String Teachers Association (ESTA) conference in Ljubljana, Slovenia, this April. The proceedings began in the courtyard of the city’s old town hall, where ESTA members gathered around a line of violin-wielding men and women wearing historical court dress; familiar faces lurked in the crowd, including those of violinist Michael Bochmann and violist Bruno Giuranna. Judgement day: just how self-critical do we need to be to get the best out of ourselves? To judge ourselves, and to be judged by others, is an imperative part of every musician’s development: it helps us to take note of our weaknesses and gives us the motivation to build on them. Yet during a violin lesson a few months ago, I made a disapproving face at the sound of my own botched martelé, and I was told off: the teacher cried, ‘Don’t be so judgemental!’ Since that moment, I have noticed the phrase, ‘It is important for students to learn in a non-judgemental environment,’ spring up time and time again. But, I wonder, is this really true? There is much evidence to support the creative merits of the garden shed – sculptor Barbara Hepworth, composer Benjamin Britten, authors Virginia Woolf and Roald Dahl and many more have blossomed in such a setting. As I sit in the glass-fronted garden workshop – a hi-tech shed of sorts – of luthier Stefan-Peter Greiner (b.1966), looking over his workbench at his lawn and house in Hampstead, London, I can understand why. Tools and partially completed instruments surround me, Mendelssohn’s piano trios hum gently from a sound system, and I have an overwhelming urge to get to work. ‘That all the world did hate,’ spits a narrator in the Royal Ballet production of Elizabeth at the Royal Opera House’s Linbury Studio Theatre this January. The words are echoed by the strangled, spite-filled sound of a cello from stage right, where a dimly lit Raphael Wallfisch sits behind two bulky stands drooping with music. Dancers, narrators, a cellist and a baritone have come together to tell the turbulent story of Queen Elizabeth I’s loves and demise, in a powerful collaboration in which Wallfisch contributes something disarmingly close to words by using only his cello and bow. Life and death, and the road that leads us from one to the next, have always fascinated mankind. Perhaps that was part of the allure of this production by composer Jocelyn Pook, director Emma Bernard and videographer Dragan Aleksic, which saw a full auditorium at the Barbican Centre’s Milton Court this January. The work took its audience on a journey into Terezín concentration camp – initially believed by many Jews to be a safe haven from the Nazis – using a poignant combination of cinematic material and live music. The stage descends into darkness; a group of actors and dancers in Elizabethan dress, lit up against an abstract golden backdrop, stands serenely on stage as a solo cello plays and an actor starts to narrate. So begins an evening’s story of love, passion, jealousy, madness and death in the Royal Ballet’s ambitious staging of Elizabeth at the Royal Opera House’s Linbury Theatre. There is a persistent argument that pervades the classical music world: to learn an instrument properly, you must start young and work hard, because it is the only way to develop your ear, your mind and your muscles quickly, effectively and in a way that will serve you for the whole of your musical life. Whether a child is destined to become a soloist or not, they must slave away from school to college, otherwise when the time comes to choose their profession, they won’t be good enough to continue if they want to. If they start when they are older or they do not progress fast enough, they will never be able to play those big Romantic concertos or build a decent career in music. Even then they will have to work, work, work, through blood, sweat and tears (sometimes literally), to achieve their goals. But why does musical development have to be like this? As a journalist, one might expect to be given some slack when participating in and writing up a music course – perhaps an audition could be skipped, or a back seat could be taken in a technique class. Not so for the Domaine Forget academy strings session in eastern Quebec. This January I found myself practising frantically to prepare recordings for assessment. When I had made the long journey into the middle of remotest Canada in July – the campus is a two-hour bus ride uphill from Quebec City – I had barely enough time to catch up on sleep before my ‘ranking audition’. When I arrive at Nicola Benedetti’s top-floor apartment in Chiswick, London, I feel more as though I am about to do an interview for House & Home magazine than The Strad. Polished wooden floors, a large corner sofa, a deep-pile silver rug paving the way to a spacious kitchen, large windows overlooking the rooftops – all signs of their jet-setting owner. Since the Scottish violinist first came to public attention in 2004, when she won the UK’s BBC Young Musician of the Year competition aged 16, she has claimed two Classical BRIT Awards and made a plethora of recordings. Last year her CD Homecoming: A Scottish Fantasty made the UK top 20 album chart – something that no solo violinist had achieved since Vanessa–Mae in 1995, and before that Nigel Kennedy in 1989. She has adorned many a concert stage worldwide over the past decade, supported by ensembles from the LSO to the New York Philharmonic. Last month I investigated how theatrical techniques can be used to help string players convey atmosphere and character to an audience. Actors and musicians told me that psychophysical awareness, confidence and imagination are all-important factors before, during and after a performance takes place. But the concert hall is not the only performance space frequented by musicians: classroom-based work can present just as many challenges to teachers and students alike. ‘I can’t help imagining what it would be like if musicians set the same standards for performance as actors,’ Finnish violinist Pekka Kuusisto told me earlier this year. ‘Actors live their roles in the theatre: they perspire them, they breathe them; everything they do is about that play. But often when I go to a concert, I get the feeling that the performer has only just started to get to know the piece. It’s a bit like going to see Hamlet and the actor says in a deadpan voice, “To be, or not to be, that is the question,” without having the background of pain that those few words require. You have to feel that the people on stage become the piece that they are performing. With classical music this is often what I miss.’ Some might feel that they do pour themselves wholeheartedly into performances and that Kuusisto is being unfair, but perhaps he has a point. After all, characters expressed in instrumental music are often less clear-cut than those presented in a play, so it can be more difficult to interpret and portray them effectively. Taking some lessons from the theatre might help musicians to invest themselves in pieces more convincingly. Yesterday evening I found myself watching a rehearsal in north London for concerts to be given by Nigel Kennedy and the Oxford Philomusica in London and Nottingham over the next three days. I spent my first few minutes in St. Jude’s Church, near Hampstead Heath, sitting on a schoolroom-style wooden chair, gazing around at the 20th-century arching redbrick walls and stunning ceiling murals all around me – but I was soon brought back to my senses. ‘Like f***ing that,’ said Kennedy gently to the orchestra, following up with some improvisation on his E string. Electric guitarists strummed away to a shuffling hi-hat, padded by rich, jazzy chords from the strings. A relaxed, hypnotic blend of music and sound-engineer chatter echoed all around. How should string teachers approach an advanced adult pupil? Over the past decade I have tried out a variety of violin teachers, and each has been very different from the last. Some have been enlightening and supportive; others have been off-putting and negligent. One even said (drunkenly) in a first lesson, ‘Well, you’re never going to be a soloist.’ His other words were not much more encouraging and I soon lost the will to practise. Other teachers, however, have given me a buzz that has lasted for weeks. Collectively they have made me wonder: what is the best way to approach an advanced adult pupil? When I was led into a basement in Shoreditch, London, by a Decca PR last year, I wasn’t sure what to expect. Gin and tonic in hand, I took my seat at a candlelit table and – as a classically trained violinist sceptical about crossover string concerts (I had come to see Time for Three, a trio of two violinists and a double bassist) – steeled myself for what lay ahead. An announcement that the group would play a mash-up of Bach’s Chaconne, Bon Iver’s Calgary and Vivaldi’s ‘Winter’ Concerto had me looking around for the nearest first exit. At first sight, the Mirecourt International Violin Competition is an inconspicuous affair. 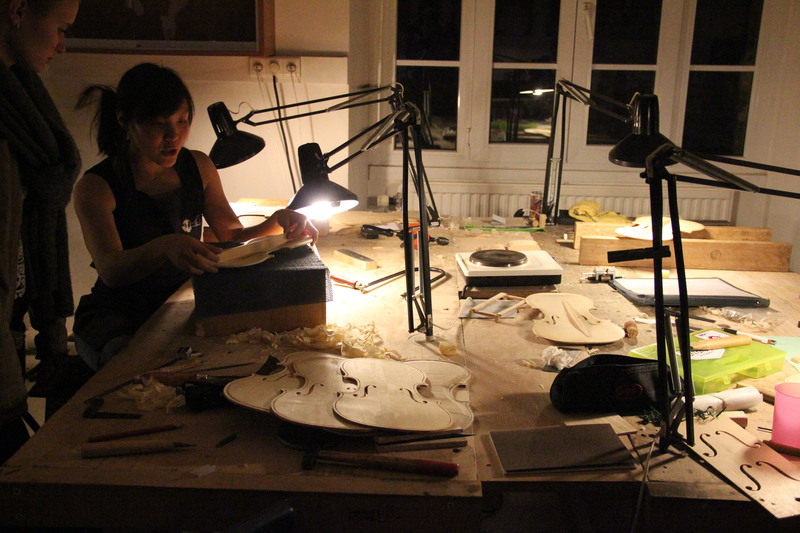 After a long day’s travel from London, I found myself in a small town in the north east of France that seemed an unlikely setting for anything very significant, despite its prestigious history in the world of lutherie. The town’s population is less that 6.500, and as far as I could see there wasn’t even a concert hall. Where was the competition going to take place? Some might say that classical music often falls victim to perfectionism: technique is honed and interpretation polished to the detriment of individualism. To follow the standard road to success one must learn the Tchaikovsky Concerto, the Brahms, the Sibelius – and play them faultlessly. Perhaps, then, it was James Ehnes’s good fortune to develop in a musical world of his own, in a remote town in central Canada: it has helped him to stand out from the crowd. He made his first major concerto debut aged 13, with the Montreal Symphony Orchestra, and recorded a CD of Paganini’s Caprices for Telarc while he was studying at the Juilliard School .Today he is a fellow of the Royal Society of Canada, a member of the Order of Canada and an honorary member of the Royal Academy of Music, with innumerable recordings of wildly varied repertoire to his name, from Bach to Ives, on a host of different CD labels including Analekta, Chandos and Onyx. One of the aims of the triennial Osaka Competition, inaugurated in 1993, is to bring attention to Japan’s classical music scene. 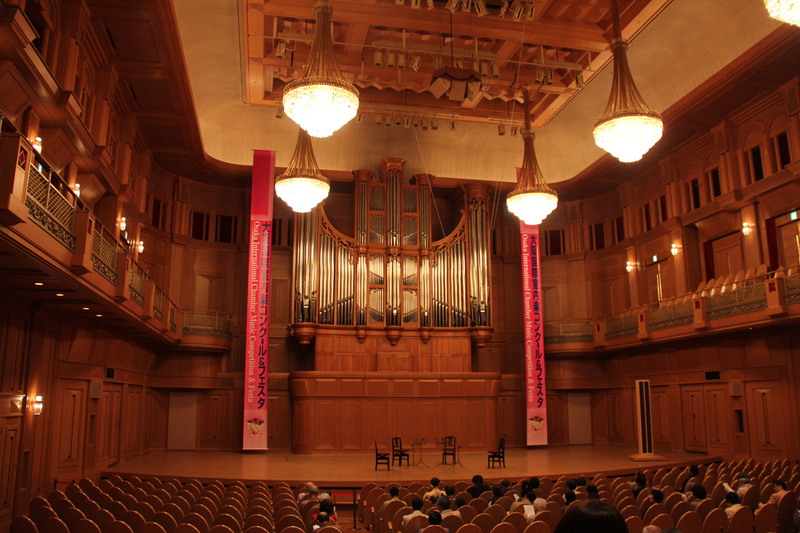 Japan’s concert halls struggle to attract an international audience, which is a shame if the competition’s Izumi Hall is anything to go by: modelled on the Great Hall of Vienna’s Musikverein, it has an enviable acoustic and 821 seats that sweep up towards the rear, under two rows of crystal chandeliers. Sadly many of these seats were empty for the duration of the competition. This has no bearing on the music: past winners include the Henschel, Doric and Attacca quartets, and this year musicians from across Europe, the US and Japan came to compete in Section I for string quartet, Section II for piano trio and piano quartet, and the ‘Festa’ for almost any other small ensemble. If I were to choose an ideal location for playing string quartets, it would probably be a quiet and spacious room with bright lighting and a good acoustic. There certainly wouldn’t be any loud music playing, or wind blowing, or people cheering and stamping: that would ruin the ambiance of, say, Dvořák’s ‘American’ Quartet, completely. This year marked the 60th anniversary of Dartington International Summer School. 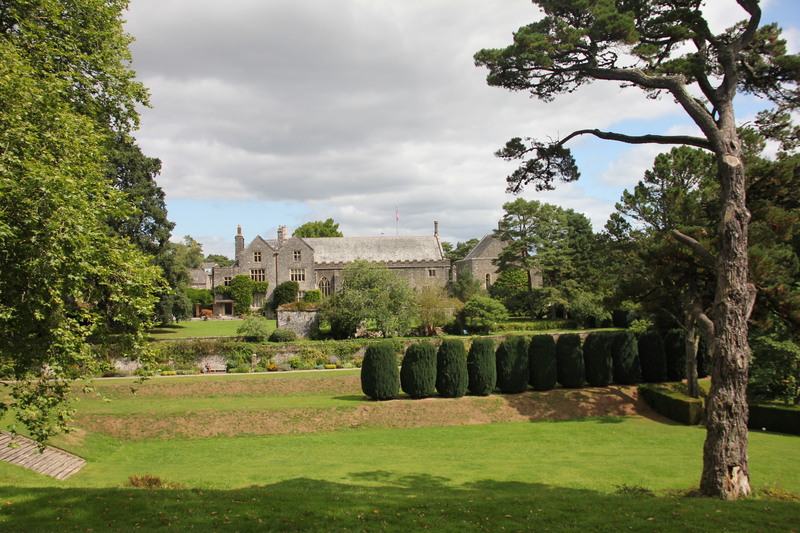 Originally set up by William Clock, with John Amis and Bea Musson, the school moved to Dartington Hall in 1953.Since then, it has welcomed amateur and professional musicians including the likes of Hindemith, Jacqueline du Pré and the Brodsky Quartet. 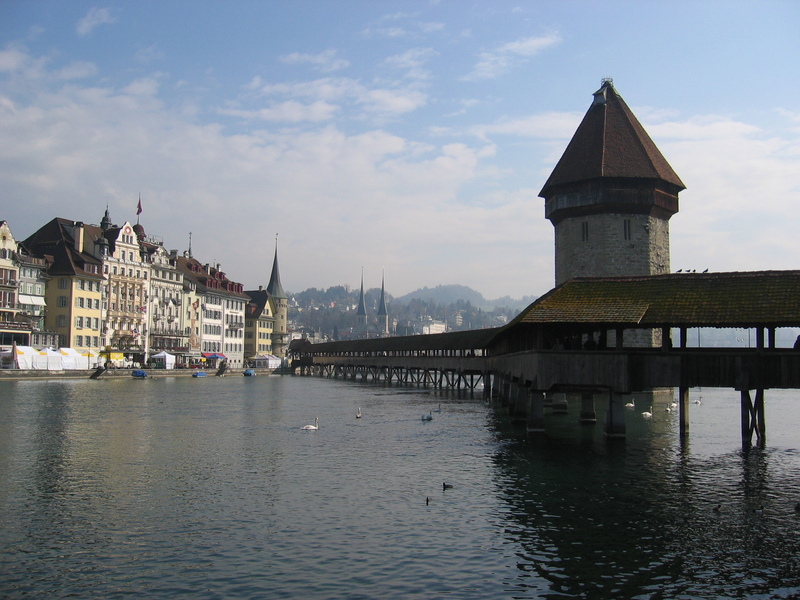 Split in two by the shimmering waters of a massive Lake Lucerne, this Swiss city combines some very rural mountain views and fresh air with the bustle of a metropolis. Time seems to have forgotten Lucerne during the past 200 years: grey and white mountains loom over huge expanses of water, which are in turn lined by historic buildings, such as the 17th-century Italian Renaissance-style town hall, with its Swiss ‘snow-proof’ roof, the Hotel Schweizerhof where Wagner stayed in 1859, and the sky-scraping spires of the Renaissance Hof Church, built in 1645. ‘I should like to write a violin concerto for you next winter,’ wrote Mendelssohn to violinist and friend Ferdinand David in a letter dated 20 July 1838. ‘One in E minor runs through my head, the beginning of which gives me no peace.’ This haunting melody plagued the composer for the next six years, thanks to a long period of self-doubt, until the Violin Concerto finally received its premiere in Leipzig in March 1845. Not only is it now one of the most popular works in the violin repertoire, with its sweeping melodies and exuberant finale, but it’s also a landmark work. For the first time in the history of the concerto Mendelssohn, inspired by Weber, linked his movements together in an attempt to keep audiences from applause until the end of the piece. And it was unusual for a work to be written in such close collaboration with a soloist: Mendelssohn asked for David’s advice right up until the first performance, even after the score was published in 1844. As a result it’s written beautifully for violin, and even the cadenza, traditionally improvised, was composed by Mendelssohn. All these ideas inspired composers – Brahms, Bruch and Tchaikovsky among them – for years to come. Schloss Grafenegg (Grafenegg Castle) is only an hour’s drive from Vienna, but as the magnificent building along with its expansive gardens heaves into view, city stresses dissolve away. 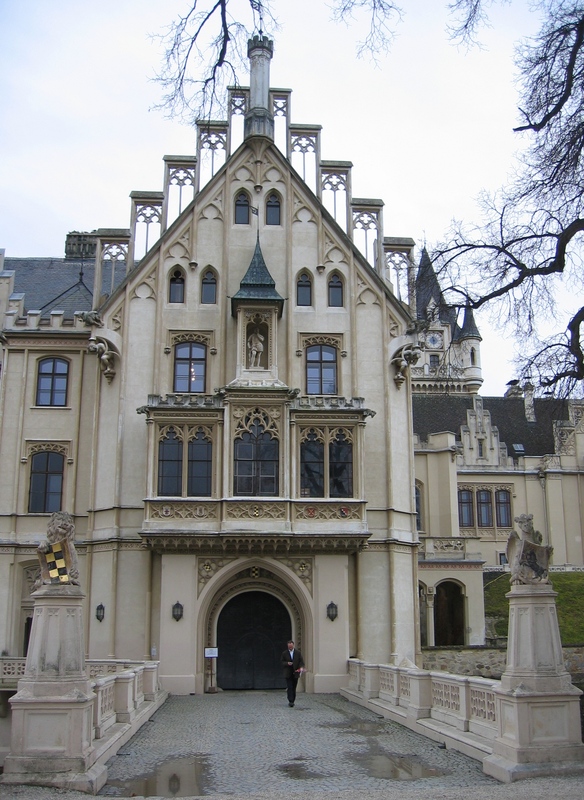 The region’s spirit dances to food, wine, music and architecture: the castle and its neighbouring historic towns, woven together by miles of rolling vineyards and the imposing, meandering Danube, have more than their fair share of gourmet restaurants, wine shops and concerts. 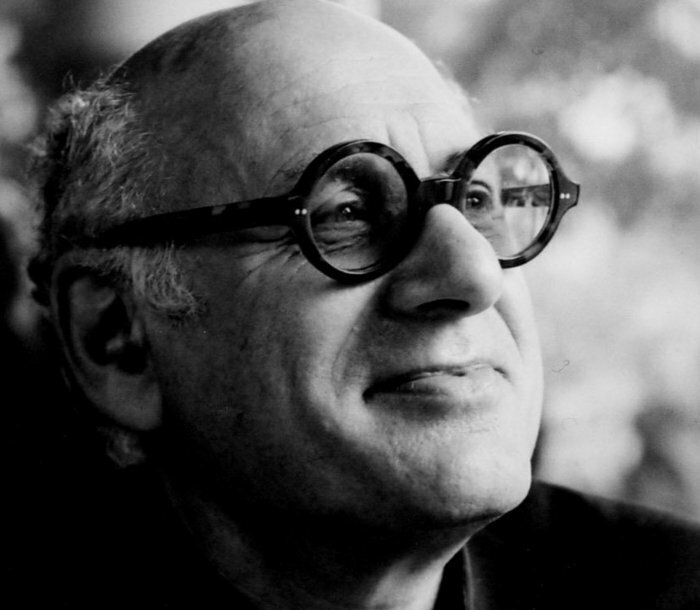 In 1968, Michael Nyman was the first person to apply the word ‘minimalist’ to music and has since made many contributions to this genre. Although film scores have given him his largest audience, including the 1993 film The Piano, he has also written concertos, operas, music for a fashion show and even, in 1993, a score for the opening of a high-speed rail link. In 2005 he launched his own record label and will release his latest opera, Love Counts, on it on 12 March. A Handshake n the Dark, a choral and orchestral work commissioned by the BBC, receives its premiere this month.